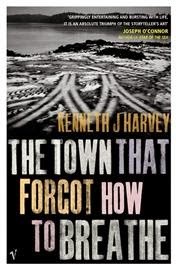 Kenneth J Harvey is an award-winning and internationally successful Canadian author, so I'm sure that in fact, large numbers of people have read The Town That Forgot How To Breathe - but I've never met one, and everyone to whom I've recommended it has stubbornly refused to do so. I find this deeply frustrating, because The Town That Forgot How To Breathe is a masterpiece of literary supernatural fiction, and in my experience works that successfully combine these genres are as rare as hen's teeth. Joseph Blackwood and his young daughter Robin have returned to Bareneed, a tiny, isolated fishing town on Canada's Newfoundland coast where Joseph grew up, to spend the summer. It soon becomes clear that strange things are happening to Bareneed, primarily that its troubled inhabitants are being gradually overcome by a strange respiratory sickness during which the ability to breathe unconsciously is lost. At the same time, Robin is haunted by the ghost of the dead child of a neighbour, Joseph becomes afflicted by possession or psychosis or both, and the sea begins to offer up the mysteriously unrotted corpses from centuries-worth of drowning victims. Tidal waves are predicted, and strange sea creatures sighted. If this sounds like a Lovecraftian, modern gothic horror novel, in many respects it is, but there is an awful lot more to the book than that. Bareneed has suffered an economic downturn after the closure of the historic cod fishing industry that has supported its people for hundreds of years, leaving the town and its inhabitants with little hope or purpose, and the disturbing, unnamed sickness that afflicts its residents can be read as a metaphor for the gradual suffocation of a community. The emotional lives of the people of Bareneed, many of whom we meet as the plot unfolds, are depicted with sensitivity and skill, and the ongoing conflict between the natural environment and its uneasy relationship with modern technology is also cleverly explored. It's probably fair to say that The Town That Forgot How To Breathe lacks focus - it's a rambling and occasionally baffling novel with a number of seemingly disparate plot strands, but it's an exceptional, incredibly atmospheric and unsettling novel that bears repeated reading and multiple interpretations. Ever since I read it about ten years ago, I've been desperate to discuss it with someone - so if someone could just bloody read it and consent to talk about it with me at great length, I'd be really quite grateful.